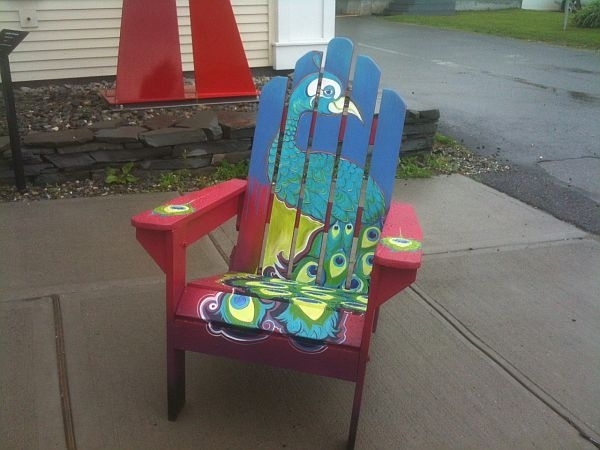 Brightly painted Adirondack chairs began popping up around the village of Morrisville this month, inviting shoppers and pedestrians to stop and sit for a while. The launch of a new, and practical, public art project means it won’t be hard to find a place to sit in Morrisville this summer. In fact, the chairs that began showing up in front of downtown businesses this week are hard to miss. The chair in front of the River Arts Center is splatter painted and covered in daisies. Over at the town offices sits a red, white and blue chair featuring a bust of a bald eagle, along with a bright fall foliage chair. And more chairs are on the way. Morrisville’s downtown organization purchased 20 folding Adirondack chairs and distributed them to local artists and community groups. And what they’re getting back are 20 unique, functional pieces of art. Tricia Follert is the town’s Community Development Coordinator; she came up with the project. She says the idea is to showcase local talent, and outshine a few downtown eyesores. "We do have some buildings that aren’t looking the best and they’re vacant. And we wanted it so when you went through Morrisville you saw beautiful artwork and you saw our community all come together by painting these chairs. So as you went through our town you didn’t see the building that was rambly and run down, you notice something great," Follert explains. When Arthur’s Department Store went out of business last year, it left vacant windows across an entire block of Main Street. On Portland Street, there are vacant storefronts where a furniture store and an auto parts store once stood. Follert hopes the chairs will draw attention to the stores that are still open for business. They’re calling the project "chair-art-able." Follert says the idea came about because townspeople were really enjoying a set of chairs put outside the town offices last summer. "We had put some chairs outside the town offices and we noticed that people liked them, sat in them often, chatted. So we decided a chair-art-able project would show our many different talents of our townspeople," Follert said. And Follert says the project is living up to her expectations, "They are fantastic. Our downtown is gonna be fantastic. In about two weeks all the chairs should be out, colorful, bright, phenomenal." Downtown businesses are adopting the chairs for the summer. The first weekend in October the town will auction off the chairs, creating a fund to buy more next year. "We are going to have bid sheets at each of the business that associate with each of the chairs. All summer long people can bid on these chairs, and then we are having a Rocktoberfest. We are closing down Portland Street in Morrisville. We’re having live bands and we’re going to auction them off," Follert said. So next time you’re in Morrisville, plan time to stop and sit for a while. And come October, you could even take a chair home.